"Award Winning Fantistics .... Consider it fantasy's baseball's version of the theory of relativity." "Fantistics InsiderBaseball is one of the better fantasy baseball websites"
VAM..Value Above Mean- It's difficult to say that any one concept is fully encompassing, but when it comes to Fantasy Drafting, the Fantistics' theory of Value Above Mean (VAM), is the definitive concept to winning on draft day. Shortly after having taken a career as quantitative analyst in the early 1990's. I realized that there had to be a formula to capture the optimal drafting strategy. The variables had to be independent of chance and expectation and needed to capture enough of a sample size to be considered valid. The result was the first published strategy (1998) on the benefit of Position Scarcity in Fantasy Sports. Although many have caught on to this concept, the model has been refined since then to also include the probability of prediction of each position. unique league. One can not reasonably argue that both league scoring and the variable of both the number of teams in your league and number of starters at each position does not in some way dictate where certain players should be valued/ranked. Each league should have a unique fantasy baseball rankings outcome. of positions should be triggered or drafted. In 1998, we developed the concept using a statistical software package (MATLAB), and since then we have run over 100,000 simulations. 2010 will be our 12th year in which we have recommended this strategy to our subscribers. A strategy which produces the optimal fantasy baseball rankings designed specifically for your league. The reason why VAM is effective is due to a theory called "positional value", or "position scarcity". The positional value system works because it values players in relation to their positional peers. In recent seasons, some fantasy folks have incorporated the position scarcity concept in their bidding or valuations without the numerical algorithm that we have quantified using the VAM formula. What is the drop-off from the best to the mid level replacement player that will be selected at each position in your draft? This is the basic tenant of Value above Mean. The elevation of value from the top performers which come from the weakest positions, according to your draft parameters. This is the principal behind our draft software. Our algorithm will produce a value (a rank per se) for each player based on your league criteria. It's really relative to your league parameters, as an example, if your league requires a high number of outfielders, it's quite possible that outfielders will be in demand, creating a righteous artificial increase in their absolute value. Depending on your league setup, subscribers who use our projections model database, will see the scarcity of quality at these positions (Catchers, Shortstops, and Third Baseman). If you're in a league that sets rosters according to position (and most are), then you have to value the incremental gain by stars (like Buster Posey C, Robinson Cano 2B, Troy Tulowitzki SS) at a higher premium, since the average player at these positions are worth much less in general than a typical player (in fantasy terms), and some of these players are substantially better than the others at their position. For instance the average catchers' production is approximately 35% less (assuming 200 drafted batters) than that of the average fantasy batter. In simple terms why pay $20 for Jay Bruce (OF) when you can purchase Buster Posey for $20. Their fantasy statistics will be comparably balanced, but Posey will outperform the typical catcher by 50%, while Bruce will only outperform the typical outfielder by 10%. Thus you capture that incremental gain of 40% (assuming a perfect world)…doing this over and over again you can see how the odds stack up in your favor (Of course we don't live in a perfect world, thus these gains will not be calculated on a 1:1 basis, as you'll read ahead in our Positional Probability paragraph). After the top 80-90 players are selected, you should start considering your positional and specific category needs. As you can see from the chart above, the incremental gain starts to diminish rapidly at this point. The software will guide you through the favorable VAM players based on your league parameters and then its time to "switch off" and consider the straight dollar values/ or rankings as the players remaining to be drafted do not show a significant difference in projected valuation. As you can see, based solely on historical stats, Catchers and Pitchers offer remarkably poor predictability. Even at 35% of last year's performance only 53% of catchers and 47% of Starting Pitchers are able to attain mediocre results. While over 87% of 1st basemen reached their mark within the 35% range. These percentages are captured in our fantasy baseball rankings. The reason for these results are numerous, but they revolve around logical explanations. Consider that the catching position is one of the most physically abusive positions on the diamond and the unnatural motion of throwing a baseball (pitchers) can take it's toll, making players from these positions a calculated risk. On the flip side, 1st basemen are historically the least likely position players to get injured. Likely due to the relative non physical nature of their playing position. The bottom line is that these variability's should be captured in any position scarcity model...and again they are captured in our fantasy baseball player rankings and cheat sheets. It's a big reason why a catcher like Joey Mauer is not the #1 player recommended to be drafted.....he likely would be based solely on a position scarcity model due to the lack of production from the position in general. Although VAM would work perfectly if we lived in a vacuum and our projected valuations turned out to be 100% prophetic...of course we don't and they're not going to be.....However through the power of mathematical probability, the odds are in your favor using the VAM strategy. It does however take more to winning a championship than just drafting an optimal set of players, you will still need to stay on top of the game during the season and make good management decisions (we'll help you here as well). The VAM strategy is incorporated in our Draft Advisor module contained within the projections software. Our fantasy baseball player rankings / valuations adjust as players are selected, adhering to the changing dynamics of your draft (changing scarcity value within the player positions). After a player is selected/drafted, the software will display/suggest the best players remaining....which should guide you to a successful outcome. Fantistics Insider baseball is an exclusive provider of the VAM theory and VAM draft day cheat sheets. 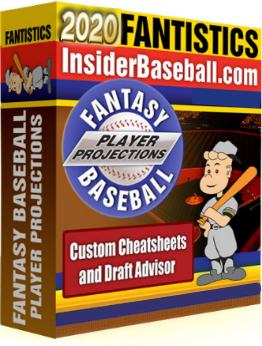 For more information on the Fantistics draft day package, click here, and when your ready you can customize your fantasy baseball Player Rankings by registering . Fantistics is more than just Draft Day Information! Recognized Experts: Since 1999, Fantistics is a recognized expert in fantasy sports. Since 2012 our National Radio show on Sirius XM radio has reached million of listeners around the country with cutting edge statistical analysis. Prospect Central: Detailed Minor League Player scouting reports throughout the week (sample report). Player Alerts: during the season we send our subscribers (via email) our Daily Insider Baseball reports, providing you with injury news, player developments, and other insight from contributing sources around the country. Trade Suggestions: we analyze and make suggestions throughout the season on overachieving and underachieving fantasy players. Power Stats: We power an online database that is fully sortable by league, position, and 18 different player production categories, including in-season fantasy player values. Player Tracker: Along with our full coverage of all the player news, we'll track your team player news' stories on one convenient page. Special Reports: gain insight into player issues & stats not discussed/ disclosed on any other site, including our expert rookie call-up section. Anthony A. Perri is the founder and the resident "Stats Nerd" here at Fantistics. Anthony is the designer of the Fantistics Projections, Grading, & the VAM drafting strategy models. His fantasy expertise has been published in several national publications, including being featured as a guest expert on Major League Baseball's official website. Anthony has worked as a He can be seen hanging around the MLB spring training facilities (wishing they let him play) during the months of February and March. Having won a "trophy room full" of Fantasy Sports Championships over the last 20 years, he hopes to continue to lead you in the same direction. The term MLB is a registered trademark of the Major League Baseball and is not affiliated with Fantistics, nor endorsed.